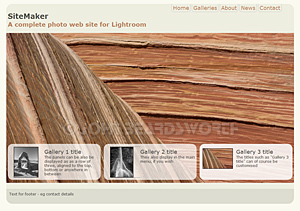 SiteMaker is the name of a new and very-soon-to-be-unleashed web gallery for Lightroom 3 which aims to create a complete web site within Lightroom. 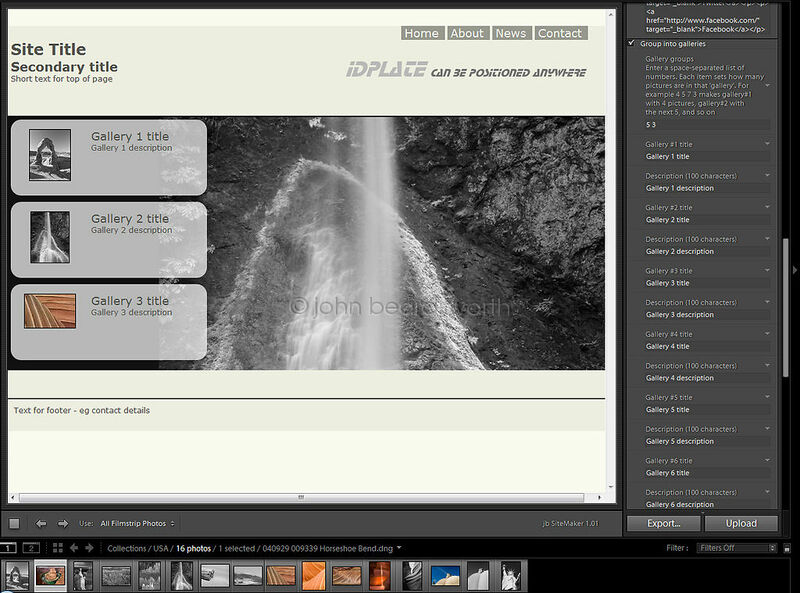 The front page is designed so you can highlight three key groups of images – for example “Latest work”, “Landscape portfolio”, “Black and white portraits”. So the top part of the site has three full width images which change as the visitor moves the cursor over the related explanation panels. Additionally, further galleries of pictures can be displayed in a grid that runs below this full width area. So the front page both highlights your latest and greatest work, and provides the visitor with immediate access to all your pictures. Secondly, people often want to add extra pages to a site – an “About Me” or contact page, for instance. So this is requirement is also built into SiteMaker. You can define up to three such pages, adding text by simply typing into boxes in Lightroom’s Site Info panel. For even more flexibility you are also able to add raw HTML, if you know how. It’s going to come in a number of versions too. SiteMakerPublisher will let you change web site contents through Library’s Publish, while SiteMakerSSP will connect the site to the SlideShowPro Director content management system. See it in action here. What do you think? I’m using LR3 html web gallery templates… and I’m looking for something better, so I’m interested to see how your template develops!! I think that arrows should be under the photos, not upper. Another good solution is to put them upper and under. It’s usually a good thing to provide several way to do the same thing, so that the user don’t have to find the buttons. I hate when next and back buttons that are in different locations on every page, and you can’t just leave the cursor in one place. That inevitably happens when the buttons are at the bottom of the page and you have portrait and landscape format images. So isn’t there a bit of a contradiction in your request? Still, I agree there should be more options and will add something before release. Just had another quick look on the iPhone and it all works fine. It all zooms okay and all the images display fine. All the links seem to be okay also. So a great effort methinks. Can’t wait till it’s out!! Incidentally I didn’t go any further with the Photomechanic tagged plug-in you mentioned a while back as I tend to work from the cards and not ingest as I used to. Couldn’t hack the wait to upload 12 gigs of images at football (all RAW). So working from the cards is much better for my sanity. >Have you tried SlidePress 2 yet? No. >And thanks for the iPhone report – I don’t use one and rely on trips to the Apple store to check out my stuff! Glad to help. Let me know if you want anything viewed on the iPhone (iPhone 4 latest system). There’s bugger all work around at the moment so I have time on my hands! How will this interact with SSP Director? At present I simply upload via Lightroom to Director as usual with SSP. I’ve just checked with my iPhone and it sees it okay (Sample site) and am keen to use it as I’m not that happy withe the clunky workaround to view on the Apple devices. So is there any further work to do with it when using Director? It’ll come in a Director version where you specify your Director details in LR Web, upload the core content, and then leave the site to pull the images from Director. I’m working on that aspect right now. Have you tried SlidePress 2 yet? And thanks for the iPhone report – I don’t use one and rely on trips to the Apple store to check out my stuff! Looks interesting….there can never be too many pieces of software that help or enable Gallery based site construction (I mean it!). This is because, how ever customisable they may be they all have a slightly different approach and so will probably deliver a different final output. Personally, the ones I’ve dumped have been those that have a feature that can’t be turned off as much as something missing. I was going to complain about the horrible overlaid exif info in yours but then realised it was the Chrome exif plugin (doh!). The other key thing is usually how intuitive they are to use as none of us really want to read the manual! I look forward to the release. I really look forward to this. I have never used the Web module for any version of LR. This looks like something I could really use!!! Kudos! Such good work! I like the clean setup and you can’t please everyone, but thank you ahead of time. When will it be available? Thanks Adriana. My guess – a week or so, but I may release a trial version earlier than that. when possible possibility to add submenus (for instance landscapes>europe in portfolio main menu…or about>me,my studio,…). jquery…could make the job.very few make this and use a simple for their menu. With these things there’s an obvious danger of trying to please everyone, so some of those things will happen – some not. A full screen mode won’t happen, but you can set image sizes up to 960 pixels. For a public-facing web site, I wonder if thumbnail grids remain as popular. The menu was something I had in mind though. And most of all, I only started writing this because I wanted to offer ways to update individual images – Tim and I were working on very similar concepts, and you know I like Director. This looks really good John, I like the simplicity of it…..couple of questions if I may…. 1) Will the titles etc that you apply to an image be picked up by a search engine? 2) Will it be possible to have thumbnails visible on the gallery? Titles yes – they’re there as regular HTML. As for the thumbnails, currently only the first image in each “gallery” is shown as a thumbnail. However, the thumbnails are all being generated and while I don’t want to make it a 3 level process – front page, then gallery of thumbnails, then full size images – there may be a way to use them in a kind of filmstrip that replaces the arrows on the full size pages. As soon as one does that though, the clean look is impaired. Compromises, compromises…. I should add that one can choose not to group images into galleries, in which case you get a grid similar to the LR default gallery. But I see that as useful more for proofs galleries rather than the “complete web site” concept. Maybe I’ll put one of these online tomorrow. Looks good John. I like the simplicity of the layout. Can the “Text For Footer” be an http link ? The reason I ask is I’m just thinking how it would work with my current setup where I have a gallery linked from Blogger and need an easy return link. It can be anything you want. One thing I dislike in LR’s built-in templates is how they “helpfully” convert your HTML, so all SiteMaker’s text areas are configured so you can enter raw HTML and it’ll be respected (so long as it’s properly written and you close your tags!). They will also look OK if you don’t write it as HTML.